Yonge + St. Clair has been overlooked for decades, but it wasn’t always that way. It was once regarded as a vibrant and bustling place – it was a scene. It was the home of Glenn Gould; it was a fashion centre; it was fur coats and martini drinking. 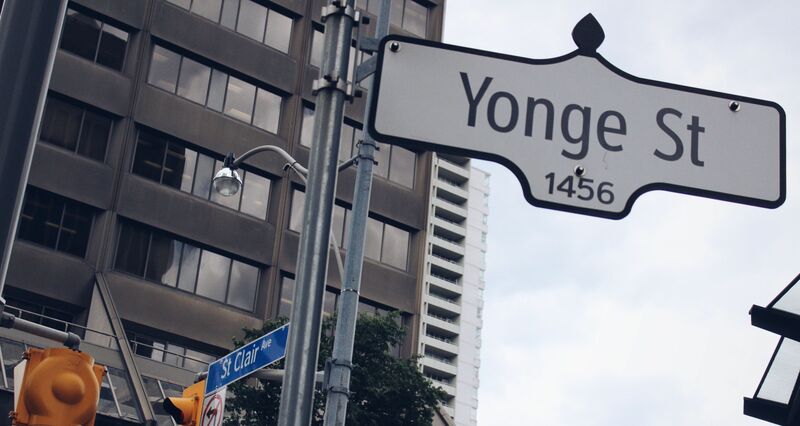 It has always been the gateway to some of Toronto’s most prominent neighbourhoods. It sits on top of an important transit hub. It is historically important. All of the ingredients are there to create a neighbourhood that is again a destination in and of itself. As reported by Bisnow, Slate Asset Management has acquired 8 office towers in the heart of the neighbourhood, including those that occupy the 4 corners of its namesake intersection. And the changes are indeed coming fast. The first phase of development at 2 St. Clair East has begun under the direction of award-winning, San Francisco-based architecture firm Gensler. An 8-storey mural by Sheffield’s renowned Phlegm now adorns the western wall of 1 St. Clair West. Vancouver-based independent coffee roasters JJ Bean are set to open one of their first Toronto retail outposts in a custom-built house in the lobby of 2 St. Clair West. And this is just the beginning. Future plans include renovations to building lobbies and exteriors, modernizing every elevator in the neighbourhood, and bringing sweeping changes to the public realm and streetscape pedestrian experience. The ultimate goal is to improve the quality of life at Yonge + St. Clair. In attracting ‘the types of tenants who can support an improved retail base’ Slate hopes to breathe new life into the neighbourhood’s 9-to-5 rhythm and take the energy up to 24-7. ‘My wife and I live in the area’, David Hopkins of restaurant consultants The Fifteen Group tells National Post, ‘and we certainly don’t go to Yonge and St. Clair if we’re looking for somewhere to eat.’ This echoes a familiar sentiment. But through the reinvention of the 4 corners Slate is confident they can change that tune. And the newly proposed patio and restaurant space at 2 St. Clair West is a leap in the right direction. Countless neighbourhoods across the city have successfully reinvented themselves with much more than a tired public sentiment working against them. Yonge + St. Clair is in a unique position to capitalize. Lucas is adamant that ‘[t]his is not a flipping strategy… It’s an own forever strategy.’ And with enough property to effectively act as their own business improvement area Slate not only has the passion but the means to make good on their promise.